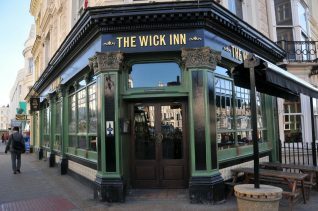 The original Wick Inn was a thatched building of some antiquity, associated with the earliest cricket ground in Hove which stood on the western side of Holland Road. It is marked on an 1844 map with the name of the publican of the Wick Inn; shown as Jem Nye’s Ground. 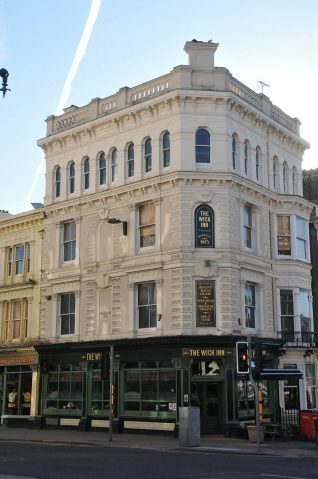 Dated 1873, the present public house is a rebuilding of an earlier Wick Inn on this site. 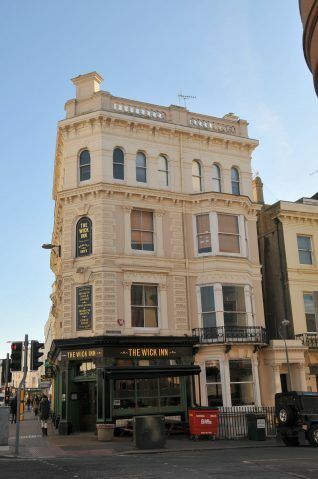 The Wick Inn stands on the corner site at the junction of Western Road and Holland Road. It is stucco over brick and has four storeys with a single narrow bay at the junction, surmounted by a stepped parapet which conceals the roofs. There are three bays on Western Road and one bay on Holland Road. Pilasters flank the window openings to the first and second floor. 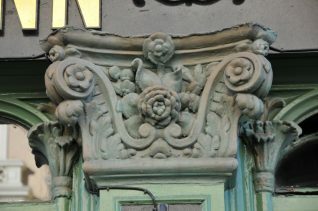 The ground floor pilasters have composite capitals of volutes, roses, and bunches of grapes.